My spice drawer gets a good workout in the fall. I want to add fall spices to as many things as possible! 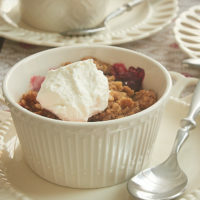 Warm, comforting cobblers made with fall fruits are a perfect candidate for doing just that. 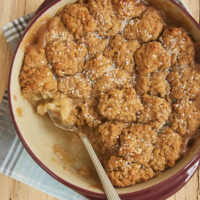 The filling for this cobbler is simply fresh pears, brown sugar, butter, some added flavor, plus a little flour to help thicken it a bit. All of that is cooked briefly on the stovetop to give it a wonderful caramel-like flavor. The topping is a simple one, but the combination of spices adds such amazing flavor. I’m completely smitten with this wonderful, warm blend of autumn spices – cinnamon, nutmeg, allspice, coriander, and ginger. The mixture of spices is a perfect complement to the pears. If you have a blend you really like, then feel free to use your favorite combination and ratio of spices. I added cinnamon to both the filling and topping. I tend to like lots of cinnamon, but you can opt to omit it (or just dial it back) in the filling if you like. Having a bit of spice carry over into the filling ensures that there’s spice in every bite. 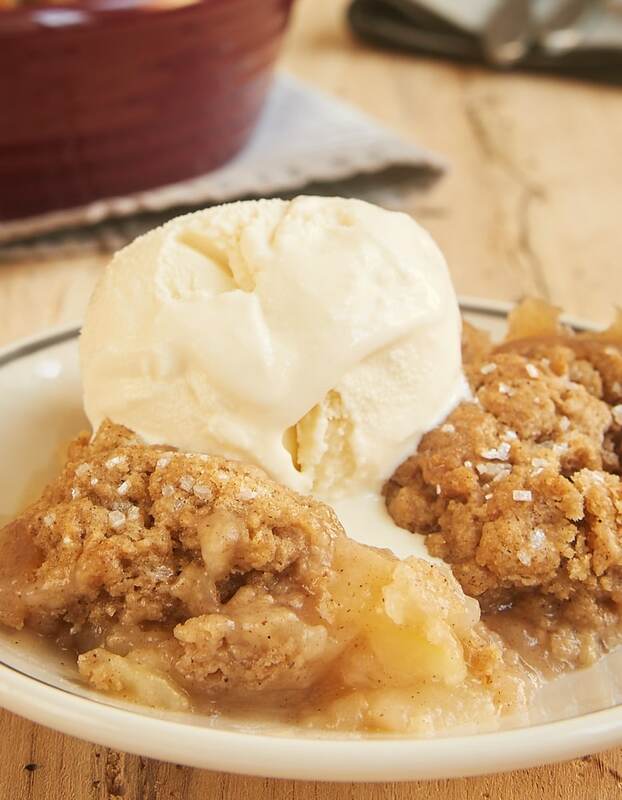 Serve this cobbler warm or at room temperature. Ice cream is the perfect companion, especially to warmed servings. I recommend either vanilla or salted caramel ice cream. No matter how you serve it, I think you’ll find that this is one of those desserts that disappears quickly. Be sure to get your serving first! 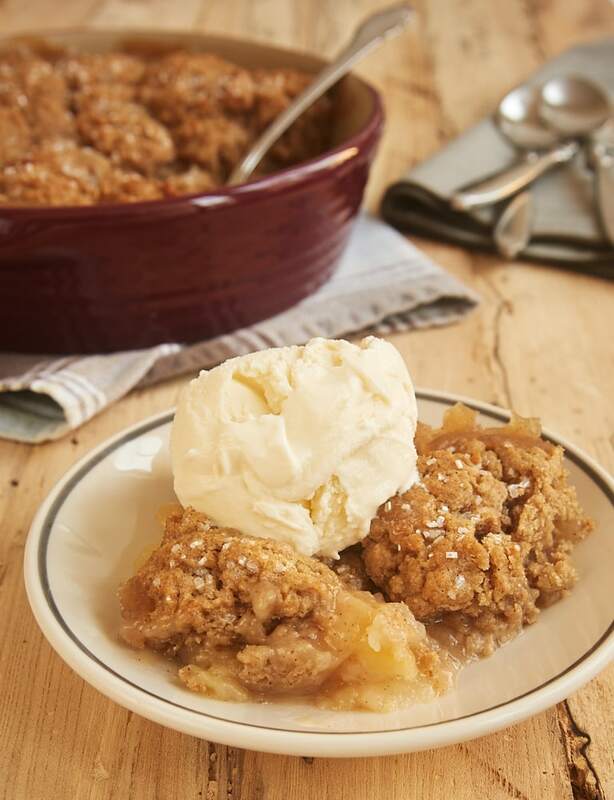 Sweet pears and a wonderful, warm blend of spices combine for this simple and delicious Autumn Spice Pear Cobbler. Melt the butter in a skillet over medium heat. Add the pears, sugar, flour, cinnamon, and salt, and stir to combine. Continue cooking, stirring frequently, until the sugar has dissolved and the mixture is bubbly. Allow the mixture to bubble for 2 or 3 minutes, or until thickened. Transfer the filling to a 1-quart baking dish. Set aside while you make the topping. Combine the flour, brown sugar, baking powder, cinnamon, cardamom, ginger, allspice, nutmeg, and salt. Add the butter, and mix with a pastry blender, a fork, or your fingers until the butter is about the size of peas. Add about 3 tablespoons of the milk, and continue mixing the dough. Add the remaining milk, a small amount at a time, and mix just until the dough comes together. Drop the dough by tablespoonfuls over the top of the filling. Sprinkle with sanding sugar, if using. 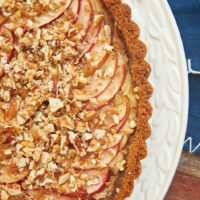 Place the baking dish on a lined, rimmed baking sheet to catch any potential spills. Bake 30 to 35 minutes, or until the topping is browned and the filling is bubbly. I can absolutely justify this for breakfast, too. 😉 Enjoy! I made this on Wednesday and now it is Saturday and I absolutely have to make another! It is delicious. I have to confess that I accidentally doubled the butter in the topping but it just made the desert richer. That’s great to hear, Sandy! It’s one of my favorites this time of year. I’ve not tried apples in this specific recipe, but I don’t see why it wouldn’t work. Just be sure you’re using a good baking apple that will hold up well after baking. 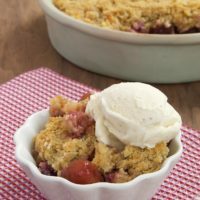 LOVE this cobbler recipe! 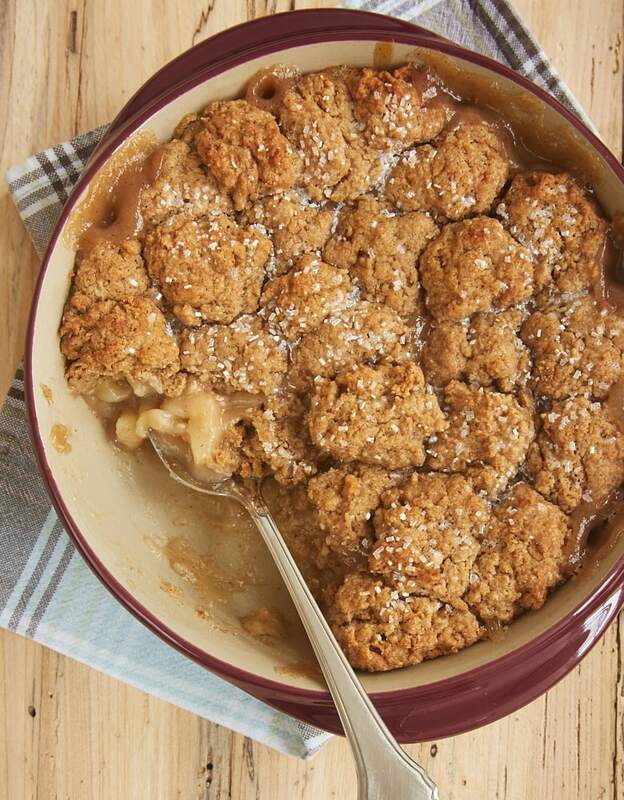 Sure beats the plain ‘biscuit’ topping cobblers I grew up with. That’s so great to hear, Karleen! This looks and sounds so good! A neighbor brought me a huge bag of fresh pears from his trees and I’ve been wondering what to do with them. I will definitely be making this tomorrow since I have the day off! 🙂 Thank you!! That’s the kind of neighbor I need! 😉 I hope you enjoy the cobbler! I have made it twice and it’s absolutely amazing. I love pears and I had mine that were in the fridge and the skin started turning brownish but the inside still intact, so I used them. So good! Me and my family loved it! I’m so glad you enjoyed the cobbler, Gabriela! I’m glad you liked it, Bridget! my pears were very hard so I covered them in water and stewed them with a cinnamon stick. 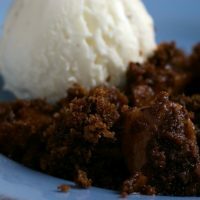 I added a small amounto to the filling, then using the same quantities melted butter, added flour and sugar, the rest of the cooking liquid and a tbs of spiced rum – made a lovely sauce to accompany the pudding. 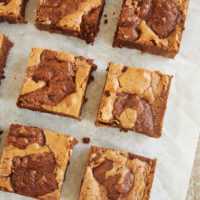 Can I make this ahead of time and place in the ‘fridge until I’m ready to bake it? Hi, Becky. Straight into the oven would be best, but prepping ahead of time would work in a pinch. If possible, I’d keep the topping separate from the filling until you’re ready to bake. Try it! It’s DELICIOUS !! 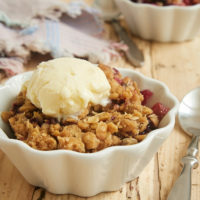 This is probably one of the most delicious cobblers I have had! Made it last week and making it again today!! Thank you so much for this recipe!! I’m so glad to hear that, Kelli! Hi, Sue. Canned pears usually have a syrup, so they might work for this recipe if they were drained and rinsed. This was the absolute recipe for pears ever. I usually use Allrecipes but they didn’t even have anything close to this. I am so happy you shared this. I give it 10 Stars. Thank you Jennifer.